Castles in and around Snowdonia and North Wales. Constructed by the English monarch Edward 1 between 1283 and 1289, soaring curtain walls and 8 huge round towers give the castle an intimidating presence. There are breath-taking views from the battlements over the mountains and sea and down to the roofless shell of the castle's massive Great Hall. The circuit of town walls, over three-quarters of a mile long and guarded by 22 towers, is one of the finest in the world. 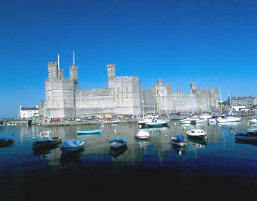 Caernarfon is possibly the most striking medieval monument in Wales, with its scale and commanding presence. Its unique polygonal towers, intimidating battlements and colour-banded walls were designed to echo Constantinople, the imperial power of Rome. Begun in 1283, its symbolic status was emphasized when Edward's son , the first English Prince of Wales, was born here in 1284. 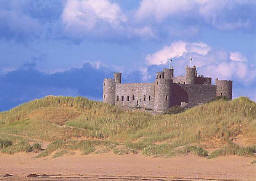 Harlech Castle is built on a rocky outcrop, gazing out over the land and sea, keeping a watchful eye over Snowdonia. 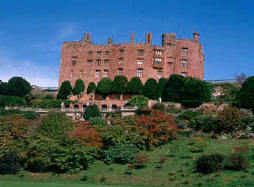 The English monarch Edward1 built it in the late 13th century to fulfil this very role. 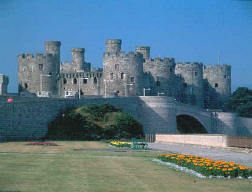 A long siege here during the Wars of the Roses inspired the stirring song "Men of Harlech". Built on its commanding headland overlooking Tremadog Bay, Criccieth Castle's history is deeply entwined in the medieval conflict between England and Wales. 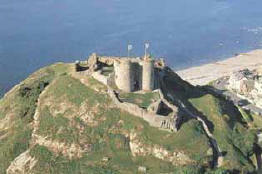 Originally a stronghold of the native Welsh princes, it was taken by Edward's forces in 1283 and extensively refortified. Beaumaris is the great unfinished masterpiece. Started in 1295, it was the last of the massive Edwardian fortresses of the 13th century to be built in North Wales, but money ran out before the fortifications reached reached their full height. 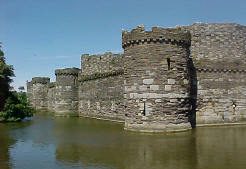 It is still regarded as the finest Welsh castle. It is the most technically perfect castle in Britain, with a symmetrical concentric "walls within walls" design that was state of the art for the 13th century. 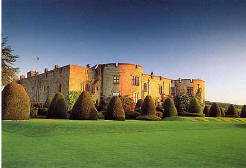 700 year Chirk Castle, a magnificent marcher fortress, commands fine views over the surrounding countryside. Rectangular with a massive drum tower at each corner, the castle has beautiful formal gardens with clipped yews, roses and a variety of flowering shrubs. The dramatic dungeon is a reminder of the castle's turbulent history, whilst later occupants have left elegant state rooms, furniture, tapestries and portraits. 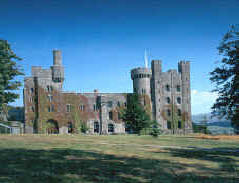 Built on the profits of Welsh slate and Jamaican sugar, Penrhyn Castle is an extravagent example of early19th century neo-Norman architecture. It is filled with intricate carvings, stained glass windows and handmade wallpapers, and features a slate bed made for Queen Victoria and a spectacular Grand Staircase which took 10 years to build. The world famous Gardens are spectacular with 4 huge stepped terraces, an orangery and topiary that looks as if it is shaved daily!